I'm a big-hearted, fun-loving editor with The Wild Rose Press in New York. On the side, I freelance as a developmental and line editor at The Exit 271 Studio. My primary focus is on fiction manuscripts by authors of thrillers, suspense, sci-fi/fantasy, and mystery. You’ll find me easy to work with (no diva here! ), professional, and fast. I’m accustomed to tight deadlines and swift turnarounds. On top of that, I used to be a commercial pilot, and like all pilots, I take pride in being on time—old habits die hard! "I found my dream editor! Val's sensitivity to my manuscript made it a pleasure to work with her. She knew exactly what had to be cut and what was needed to make my manuscript soar. Val is easy to talk to and her quick turnaround time is a huge plus. I can honestly say after working with Val, I have become a better writer and a client for life." "When I got Val's feedback, I was surprised at the clarity with which she could see what I was trying to do and nudge it in the right direction." "Her story suggestions are succinct and on point … she can peer not just into your mind but also your soul and know where you want to take your story, or where you ought to take it, and how to get there by the best marketable route." In the past, I flew airplanes for a living, and once I ate an entire bag of Fig Newtons on a spontaneous road trip from New Orleans to Philadelphia to see the Live Aid concert. No more fig bars for me! Since my flying days, I earned a Bachelor of Fine Arts from the University of Georgia and a Master of Arts in Professional Writing from Kennesaw State University. I've taught English Composition to first-year college students, tutored in the university’s writing center, and edited for The English Broadside, Red Clay Review, the SurfCoaches website, and the Georgia Writers Association's literary journal. I stay active in the writing community. In fact, I regularly conduct writer workshops, volunteer as a judge for fiction writing contests, and present at writer's conferences. 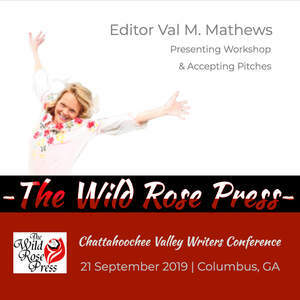 A video clip of me speaking at the Chattahoochee Valley Writers Conference is available on my LinkedIn. I am an active member of the Editorial Freelancers Association. I love editing because it's always like a road trip (but without the figs). "A notable writing and editorial coach, Val possesses a brilliant approach to the smooth exchange of ideas with clients ... Most noteworthy, she made it easy to release my innermost thoughts, emotions, and creative ideas for her critique. Highly respected and valued, Valerie delivers splendid results." "After my short story Samuel’s Wife was accepted for publication, Val Mathews worked with me to improve it. Respectful of me as a writer, she suggested no changes that would upset my voice and writing style. With an expert’s eye for detail, Val caught redundancies and irrelevancies, mistakes that muddled the clarity and disrupted the rhythm of the story. I would not hesitate to work with Val again. A true professional, she’s a meticulous editor. I loved working with her and would recommend her to anyone in search of an editor." ~Brenda Sutton Rose, "Samuel's Wife"
, meaning the better maker. Your staff certainly qualify for that label. Thank you for your generosity in time and effort." In the meantime, keep your eyes on the stars and your feet on the ground. Graduate Teaching Assistantship, Kennesaw State U.
Freelance editorial services for writers who need love, support, and a kick in the pants. Join Reedsy to request a free quote from Val and over 1,000 similar profiles.